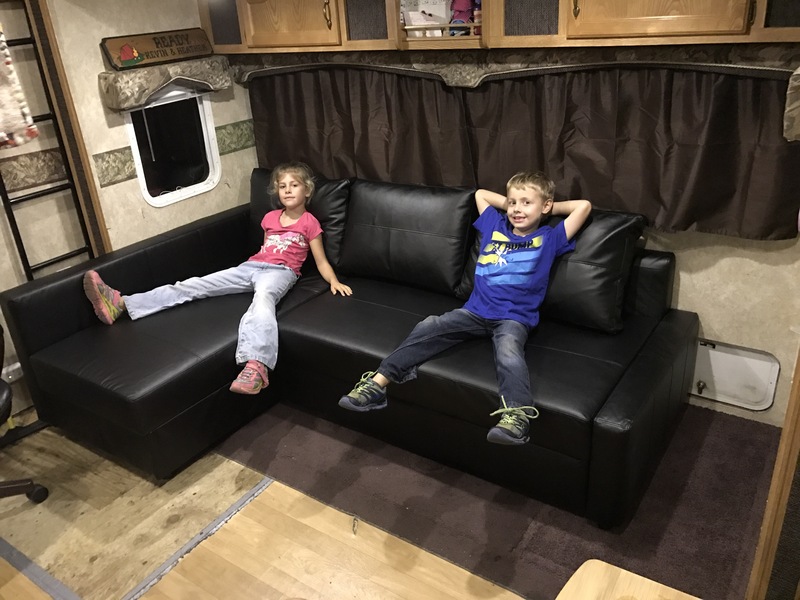 For the past year and a half we have been using the wrap-around couch and dinette that came pre-installed in the fifth wheel. 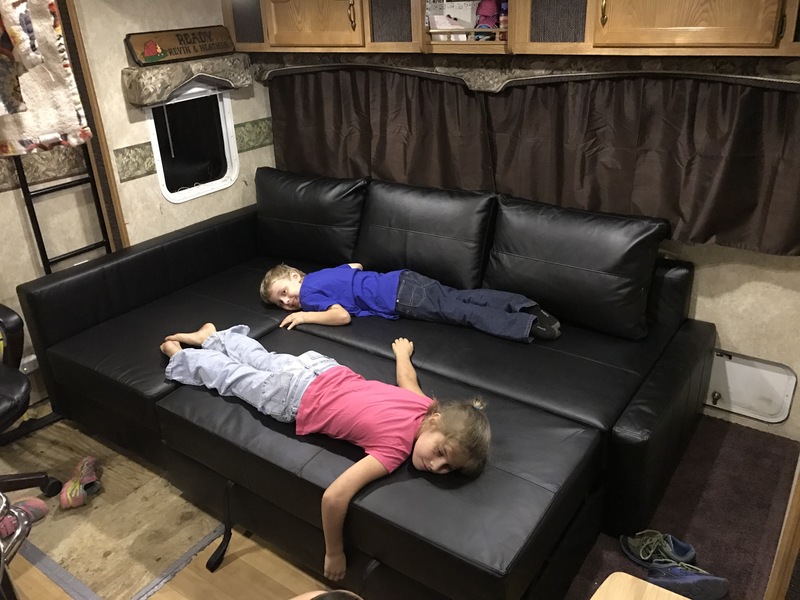 The couch offered plenty of seating for our family, but like factory RV mattresses, its comfort left much to be desired compared to our residential couch we had prior to moving into the RV. The table was adequate, but whenever we had guests over for a meal the table space became quickly cramped and no place to put any food once everyone’s place settings were on the table. Heather has voiced her dislike of the current setup a few times, but we really didn’t like our options. Typically we could have a small table with 4 chairs and a loveseat, or a wrap-around like we had. The alternative option really didn’t fit the needs of our family, so we left the wrap-around in place. 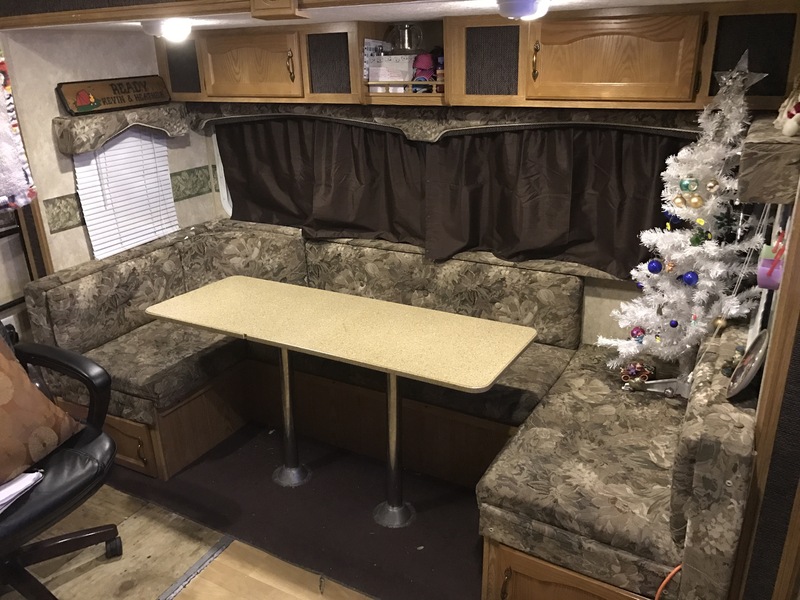 Our current plan is to continue the RV lifestyle for at least a few more years minimum with this fifth wheel, so we would like to have a setup that we enjoy instead of simply tolerating since it will be our home for years to come. Well, Friday on our way to see the manatees we discovered an IKEA store in Tampa. After viewing the manatees we circled back and browsed the store while the kids played in their free Play Land including a ball pit. 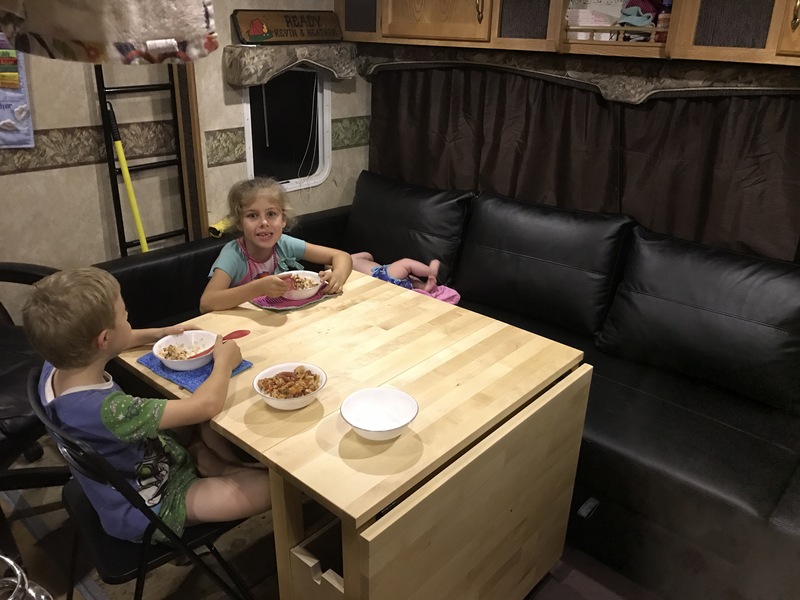 We found a third option for our dinette dilemma and after taking some pictures and notes we headed home, escaping the IKEA store with a receipt totaling less than $50. At home we measured, diagramed our space on paper, and discussed the option. Yesterday we returned to the IKEA store, dropped off the kids in the Play Land and headed back to our potential renovation items. After confirming that it would in deed suit our needs for both function and comfort, we made our purchases and picked up the kids. Back at home we quickly disassembled the dinette, zipping out screws and moving pieces outside. The entire disassembly of the dinette, with the assistance of Pie and Bug who were eager to help, took less than 1 hour from start to finish. 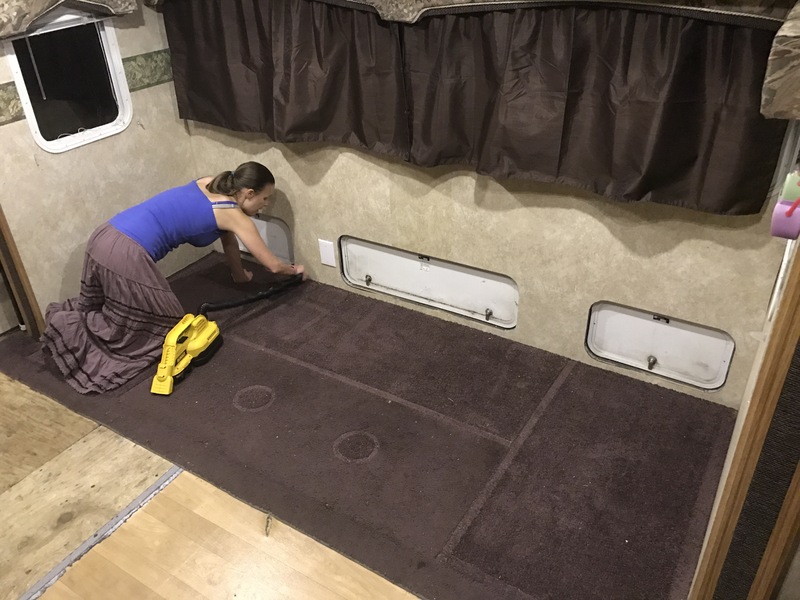 The carpet was vacuumed and installation was started. We did lose some under-bench storage space in the process of the renovation, but between our recent underbelly reorganization/clean-out and the recent addition of our Annex, we can afford to lose some storage space under the dinette. The result of our renovation is a 3-seat sleeper sectional with chaise and a new table. The chaise lifts up to reveal storage within it, so not all of our prior storage space was lost. The bottom of the sofa pulls out and turns into a sleeper of pretty decent size. The table features 6 drawers (3 on each side) and 2 wings that can be used separately or together to create a table size from the minimum 10.5 x 31″ to a max of 31 x 60″ which gives us a great deal of versatility. It is also not fixed to the floor, so it can be turned and moved around as needed. The sofa is also not quite as long as the dinette was before, so we can actually store the table at the end of it and out of the way. We are very happy with our little conversion. I still need to seal the three exterior cabinet doors along the floor a little better now that there is no buffer between the doors and our living space, but that should be easy enough.